Why Would I Want A Webshop? You can’t ignore Internet. Whatever the time of day, someone’s on it. In fact, even if only one person out of every hundred with an Internet connection was online, forty million people will be online every single minute of the day. So maybe the title should read, “How Do I Start My Webshop” instead. Remember the late nineties? When getting online took a phone line, a lot of strange noises and forever. We now have ultra-rapid Ethernet and WiFi. What’s the next step? Whatever it is, it will mean even more potential customers. So if you want to sell your product, you have to make it easy. After all, no-one has the patience to wait for a slow connection anymore. Roy Morgan Market Research and Analysis reported that in March 2018, 9.46 million Australians over 14 – that’s nearly half of the adult population – made an online purchase at least once a month. According to Roy, that’s an increase of 590,000 in the past 12 months. Other studies show that 15% of Australians (over 14) make use of comparison websites when shopping. So not only must your website be fast and look good, it needs to offer competitively priced products. If it does that, it can reach that 9.46 million in Australia, and countless other millions abroad. So how much do we spend online? Well, in 2017 Australians alone spent over $21 billion on Internet purchases. And Australians tend to buy less online than the Asian, European or American consumer. But this number is set to increase steadily. 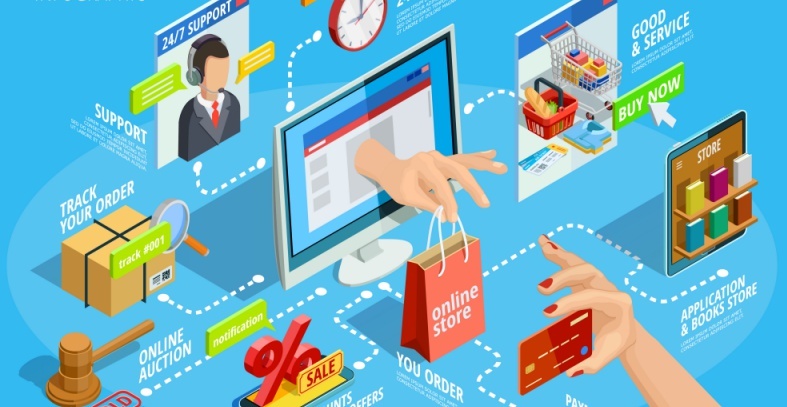 Some marketing firms predict huge rises in online sales in the next one to two years. Just fifteen years ago, any webshop was a rare phenomenon. Many shopkeepers and companies didn’t see the threat. Now, huge companies such as Amazon and marketplaces like AliExpress are taking huge bites out of the commercial pie. In order to compete against them, you need to create a personal, secure and well-priced service that potential customers can immediately see on their search engine results. Webshops are steadily taking over commercial country, pushing their way into every sector which offers a service or a product to a consumer. Borders don’t count when it comes to making a purchase thanks to rapid courier services and cheap postage. Consumers don’t have to stick to local manufacturers to get the product they want at a price they like. The natural step for startups or more traditional retailers and manufacturers is to set up an own webshop. This can be a nightmare, keeping up with the latest versions of a thousand products, making price adjustments, choosing the best and the most secure payment gateway, designing catalogues, taking pictures, making sure your webshop gets listed in all the best search engines. Simply opening a door and waiting for a customer to step in has no place in the digital world, however pretty that traditional picture might seem. What does a good webshop look like? What your webshop looks like depends on various factors. Your potential customers are not only sitting at desktops at home or in the office, they are on the move, using various devices to surf the web. A lot of them are used to making spontaneous purchases. Some of them check out a hundred websites and reviews before parting with their hard-earned cash. Static websites are digital dinosaurs. Anyone who makes good quality websites or webshops knows how to make the online environment dynamic and responsive, working seamlessly with any operating system, any size screen, and any device. A webshop needs to be tested, not only for its potential profits, but for its ease of use. The right navigation, the right branding, the right calls to action, the right influencers and the right encryption are just a small part of the package. If those terms mean little to you, you will need help setting up and updating a successful online store. You also need to take into account your own company mission together with the preferences and aims of the worldwide billions of potential customers browsing for your particular product or service. What you think looks good might turn your target group away. For the design task alone, a good website development and design service is worth its weight in top-of-the-range mobile devices. Not only will a professional service work on webshop design and compatibility, he, she or they will also create ways for you to make simple revisions to prices or item descriptions, and add blog pages and other marketing methods to keep your clientele engaged. A good professional service will mean you won’t need to hire extra internal staff, as keeping on top of a successful webshop requires both time and energy. You only need to browse through the sea of forgotten websites on page 150 of a Google search to experience the stark reality of the website graveyard for yourself. Anyone who takes their current or future webshop seriously wants to offer his or her customers a user-friendly and secure environment for shopping online. In order to do this, either you need to have trained as a web developer and designer and have marketing skills too, or you need to hire someone else who does. There’s more to finding the right webshop development service than opening up the local Yellow Pages and sticking it with a pin with your eyes closed. First of all, your service never needs to be local unless you are specifically aiming for a local audience and prefer someone who knows what life in your town is really like. In which case, a simple placard, a great-looking shop window and a series of colourful flyers will do the trick. But this is the exception to the rule. Getting your product out to as many potential customers as possible is a skill that not many of us possess without long periods of training. And the wider the audience, the more skills you need. Most businesses aim to expand their territory when it comes to getting and keeping their customers, which is why finding a Brisbane-based website developer when you are based in Perth isn’t a problem. Look up sites you aspire to and see who designed them. Go by word of mouth. Look at your competitors and see how they attract your clients. Make sure you have a basic idea of what you want, and then meet with two or three design and development professionals and see how forward-thinking and accessible they are. Let them know how much you are prepared to do yourself. Then watch as your webshop and website take shape. With the right agency, you are guaranteed real sales, not potential sales.